There’s evidence that foxhunting in central Ohio has been in existence since the 1790s. It was established on an organized basis with the 1903 founding of the Columbus Riding Club. Major Harry Brown, honorary huntsman, leading the Rocky Fork hounds down the Rocky Fork Hunt and Country Club driveway, in 1934. The Hunt’s stables appear on the hill in the background. This group gathered a pack of hounds and hunted in the Alum Creek area east of Columbus. 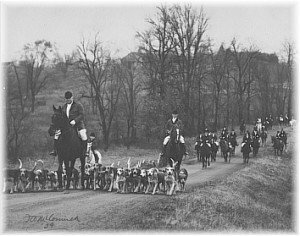 In 1911 the hounds were transferred to an organization known as the Dean Valley Hounds, hunted by Dr. Harry Brown around Central College. 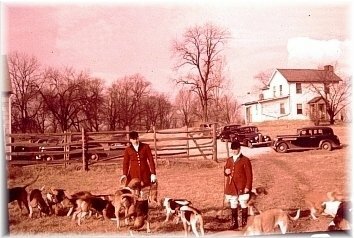 Then in 1925 these hounds, which were owned by Dr. Brown and Mr. F. Everson Powell, were integrated into the entity that eventually became the Rocky Fork Headley Hunt (RFHH). The RFHH owes much of its being to one man, Walter Jeffrey. Mr. Jeffrey grew up in a wealthy household in an affluent area near Franklin Park, the son of Joseph Jeffrey, who made his wealth as the founder of the Jeffrey Manufacturing Company, one of the world’s leading makers of coal mining machines. Walter Jeffrey became a self-made man himself, all the while retaining his strong love of horses. He entered military service and joined General Jack J. “Black Jack” Pershing and rode against Pancho Villa in the Mexican Campaign of 1916. After coming home from World War I in 1920, Walter Jeffrey tried to return to the lifestyle he had left behind, but found that it had changed. Mr. Edward Durell, honorary huntsman, and Mr. Fred Craft, whipper-in, preparing for a hunt in 1939. Walter Jeffrey and many of his friends stabled, were becoming less enthralled with the idea of sharing their grounds with horses. So Walter Jeffrey recognized that the time had come to move further from the city, and in 1923 quietly acquired a large amount of land along Clark State Road east of Gahanna, containing some of the most scenic country in central Ohio. At about this same time, a group of men became interested in having a club less formal and less elaborate than the existing country clubs in Columbus, and founded the Rocky Fork Hunt and Country Club in July, 1925. Walter Jeffrey made some of his Gahanna property available to this new organization and joined as a member. Enjoying the hounds are Dr. Trent Smith, MFH 1971-1981 and honorary huntsman, and Cynthia Jeffrey, then a whipper-in who later became an MFH, in the 1970s. Soon thereafter, though, it became clear that some of the club’s members were more preoccupied with riding than playing golf, so The Rocky Fork Riding Club Co. was established in November of 1925 for the purposes of “providing the privileges and benefits of and the means and facilities for the promotion of and instruction in horseback riding, driving, hunting”. Walter Jeffrey was elected the club’s first president and also served as the honorary huntsman for awhile and as an Honorary Whipper-in. In addition, he was an avid polo player and the driving force behind the organization of the Columbus Polo Team in 1924. Therefore, polo was also an important part of the Rocky Fork Riding Club at its inception, as was foxhunting and general riding. 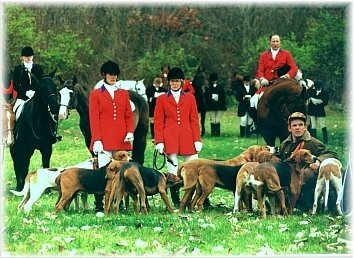 But over the years the interests of its members focused on foxhunting and the other affiliations were dropped. 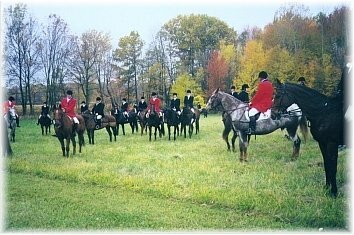 The Rocky Fork Riding Club actually used the name “The Rocky Fork Hunt” almost since its founding, but its name was not formally changed until 1933 through agreement with Rocky Fork Hunt and Country Club, which continues to use that original name today. Taken at the Blessing of the Hounds in the late 1980s are J. Richard Argo, Lynne Ashbrook, MFH, James Shaw, MFH Cynthia Jeffrey, MFH, and Dr. Donald Vincent, in the late 1980s. Mr. Argo and Dr. Vincent were fieldmasters at the time. In 1935, a group of members of The Rocky Fork Hunt organized another hunt in the area of Zanesville, which they named the Headley Hunt, Inc. as a romantic reincarnation of a pack of hounds owned by Usual Headley, who hunted hounds for the entertainment of his tavern guests as early as 1802. Trafford Tallmadge and Sally Jones were established as MFHs, with other notable directors including John W. Galbreath, Samuel L. Black, Jr. (father of future RFHH MFH Cynthia Black Jeffrey), Edmond B. Howard, Edward Durell and J. Wallace Huntington. Mr. Howard was also a major land-owner, and built stables and kennels on his land for the Headley Hunt. In 1940, the two hunts were merged and agreed to be called The Rocky Fork Headley Hunt (RFHH), with Dr. Teachnor and Mr. Summers continuing as MFHs, Will Leverton as Huntsman and Trafford Tallmadge as President. Both countries were hunted for a few years, until hunting was suspended for the duration of World War II. After the war, hunting resumed, but essentially only in the Gahanna area, until additional country was opened in Jersey in 1970. Blessing of the Hounds in the late 1980s. MFHs Lynne Ashbrook and Cynthia Jeffrey are shown on foot accompanied by kennelman Junior Burgess. Mounted in the background are Amy Ashbrook Comisford, then a whipper-in who later became an MFH, and Col. Walter Morgan, whipper-in. Hunting in the late 1980s. James Thorson, whipper-in, is followed by fieldmaster Dr. Don Vincent, then (from front to back) Polly Lindemann, Bob Lindemann, Connie Coultrap and Hugo Trux, III. RFHH is a Membership Hunt as defined by the MFHA, with its Board of Directors and MFHs elected by the subscribing senior members of the Hunt. The MFHs run as a slate, not individually, and the slate is approved by the Board. The MFHs manage the hunting and land owner responsibilities, including the professional and honorary staff, while the Board focuses on the financial and social aspects of the Hunt, including the necessary events required to support the Hunt’s fiscal responsibilities, such as Hunter Paces. All Hunt activities are governed by the RFHH’s Code of Regulations, which can be modified by the majority vote of senior subscribing members. A lull in the hunting action in the mid-1990s, taken in the back of Carlin’s house in the Jersey territory. Identifiable members are Bill Dreger in red on the gray, Col. Walter Morgan in red on the chestnut, Dr. Michael Fraley on the clipped bay, Stan Shayne in red next to Elaine Shayne and Kate Rigg all on bays, Sharon Chappelear (side view) on the chestnut and Jim Thorson on the Appaloosa. Over the years, the RFHH has had a variety of professional and honorary huntsmen. From 1970 through 2004 one of the MFHs always served as the honorary huntsman. 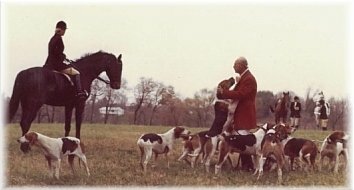 Crawford Louthan then served as the professional huntsman from early 2005 through late 2006, during which time he imparted much knowledge about hunting and hounds to the staff. The horn was then picked up by member Sally Crane in the fall of 2006, assisted by MFH Sharon Chappelear, who had hunted the hounds during the 2004-2005 season. The resultant sharing of responsibilities has enhanced the participative nature of the duties of hound walking among staff and members, thereby increasing their familiarity with the hounds and hunting practices. This has been done without any apparent sacrifice to the quality of the hunting provided, which is a tribute to all of those huntsmen who preceded the current staff. 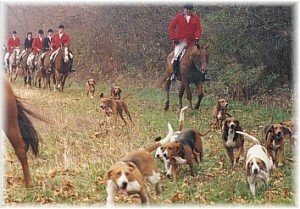 RFHH prides itself in being a democratic hunt and encourages its members to adhere to the “Creed of Foxhunting”, written by William M. Summer, Past President and ex-MFH.